The paper addresses the issue of informal urban development with a special focus on planning control and integrated land-use management as a means to prevent and legalise such development. In this context the paper presents an overall understanding of the land management paradigm for sustainable development. The paper then identifies the diversity of planning systems in a European context and the key legal means of control. Planning is politics. The framework for political decision-making should therefore be organised to facilitate an integrated approach to land-use management that combines the three areas of land policies, land information management, and land-use management. Such a framework, that includes monitoring and enforcement procedures, should support sustainable development, and, at the same time, provide the basic means for preventing and legalising informal urban development. The paper addresses the issue of informal urban development with a special focus on planning control and integrated land-use management as a means to prevent and legalise such development. The Paper is focusing mainly on the European region. Today there are about 1 billion slum dwellers in the world, while in 1990 there was about 715 million. UN-Habitat estimates that if the current trends continue, the slum population will reach 1.4 billion by 2020 if no remedial action is taken. In 2005 the world´s urban population was about 3.2 billion out of world total of about 6.5 billion. Current trends predict the number of urban dwellers will keep rising, reaching almost 5 billion in 2030 where 80% will live in developing countries. Over the next 25 years, the world´s urban population is expected to grow at an annual rate of almost twice the growth rate of the world´s total population. (UN-Habitat, 2006). In this perspective, where one of every three city residents live in inadequate housing with few or no basic services, it becomes urgent to focus on informal settlement and find ways and means to influence government policies and actions. This also relates to the Millennium Development Goal 7, target 11 stating that by 2020 to have improved the lives of least 100 million slum dwellers. The Millennium Development Goals provide an apt framework for linking the wealth of cities with increased opportunity and improved quality of life for their poorest residents. In many countries, however, prosperity has not benefited urban residents equally. Mounting evidence suggests that economic growth in itself cannot reduce poverty or opportunities if it is not accompanied by equitable policies that allow low-income or disadvantaged groups to benefit from that growth (UN-Habitat, 2006). In the European region informal urban development do occur to some extent, especially in Mediterranean countries, even if the scale is much smaller and also different to the situation in most developing countries. But, in principle, the problems are the same and relate to factors such as lack of adequate legal structures; lack of social and economic institutions for providing and financing low cost housing; lack of updated records and maps and monitoring procedures; bureaucracy and lack of transparency; expensive and time consuming procedures for obtaining the relevant permits and registrations; and political reluctance (Potsiou, 2006). At the more global scale FIG is committed to the UN-Habitat agenda around the Global Land Tool Network (GLTN) that aims to facilitate the attainment of the Millennium Development Goals through improved land management and tenure tools for poverty alleviation and the improvement of the livelihoods for the poor. Informal urban development may occur in various forms such as squatting where vacant state-owned or private land is occupied illegally and used for illegal slum housing; informal subdivisions and illegal construction work that do not comply with planning regulations such as zoning provisions; and illegal construction works or extensions on existing legal properties (Potsiou, 2006). There is no simple solution to the problem of preventing and legalising informal urban development. The problem relates mainly to the national level of economic wealth in combination with the level of social and economic equity in society, while the solutions relate to the level of consistent land policies, good governance, and well established institutions. Land policies may be seen as the set of aims and objectives set by governments for dealing with land issues. Policy implementation depends on how access to land and land related opportunities are allocated. Governments therefore regulate land related activities, including holding rights to land, controlling the economic aspects of land, and controlling the use of land and its development. Administration systems surrounding these regulatory patterns facilitate the implementation of land policy in the broadest sense, and in well organized systems, they deliver sensible land management and good governance. In this regard it is important to understand the dimensions and implication of land management as a paradigm for dealing with land rights, restrictions and responsibilities. This is explained in more details in section 3 below. It is important to note, however, that where the problem of unauthorised developments occurs, the particular characteristics of the planning system may only play a minor part in explaining it. Factors outside the formal planning system will often play a determining role in its operation and effectiveness. Factors such as the historical relationship between citizens and government, attitudes towards land and property ownership, and implications of social and economics institutions in society will all play a part amongst other historical and cultural conditions (European Commission, 1997). Land management encompasses all activities associated with the management of land and natural resources that are required to achieve sustainable development. The concept of land includes properties and natural resources and thereby encompasses the total natural and build environment. Land policy is part of the national policy on promoting objectives including economic development, social justice and equity, and political stability. Land policies may be associated with: security of tenure; land markets (particularly land transactions and access to credit); real property taxation; sustainable management and control of land use, natural resources and the environment; the provision of land for the poor, ethnic minorities and women; and measures to prevent land speculation and to manage land disputes. The operational component of the land management paradigm is the range of land administration functions that ensure proper management of rights, restrictions, responsibilities and risks in relation to property, land and natural resources. These functions include the areas of land tenure (securing and transferring rights in land and natural resources); land value (valuation and taxation of land and properties); land use (planning and control of the use of land and natural resources); and land development (implementing utilities, infrastructure and construction planning). The land administration functions are based on and are facilitated by appropriate land information infrastructures. The land information area should be organised to combine cadastral and topographic data, and link the built environment (including legal and social land rights) with the natural environment (including topographical, environmental and natural resource issues). Land information should, this way, be organised as a spatial data infrastructure at national, regional/federal and local levels based on relevant policies for data sharing, cost recovery, access to data, data models, and standards. The four land administration functions (land tenure, land value, land use, land development) are different in their professional focus, and are normally undertaken by a mix of professions, including surveyors, engineers, lawyers, valuers, land economists, planners, and developers. The interrelations appear through the fact that the actual conceptual, economic and physical uses of land and properties influence land values. Land value is also influenced by the possible future use of land as determined through zoning, land use planning regulations, and permit granting processes. And the land use planning and policies will, of course, determine and regulate future land development. Sound land management is the operational processes of implementing land policies in comprehensive and sustainable ways. In many countries, however, there is a tendency to separate land tenure rights from land use rights. There is then no effective institutional mechanism for linking planning and land use controls with land values and the operation of the land market. These problems are often compounded by poor administrative and management procedures that fail to deliver required services. Investment in new technology will only go a small way towards solving a much deeper problem; the failure to treat land and its resources as a coherent whole. With regard to Europe, and talking about informal urban development, there is also still some way to go. Many countries in Europe, especially in the southern and eastern regions, are facing problems in this regard. To deal with this it is important to understand the cultural diversity within the European region and also the deriving diversity of planning systems within the European territory. This is presented in more details in the following chapter. There is no such thing as the common planning system for the European countries. Planning systems varies considerably in terms of scope, maturity and completeness, and the distance between expressed objectives and outcomes. The systems also varies in terms of the locus of power e.g. 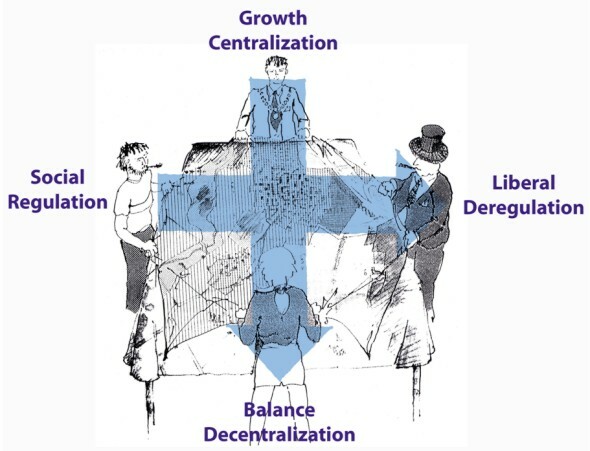 centralisation versus decentralisation, and the relative role of the public and private sector e.g. planning led versus market led approach (European Commission, 1997). More generally, planning systems are to some extent determined by the cultural and administrative development of the country or jurisdiction – just like is the case for cadastral systems. 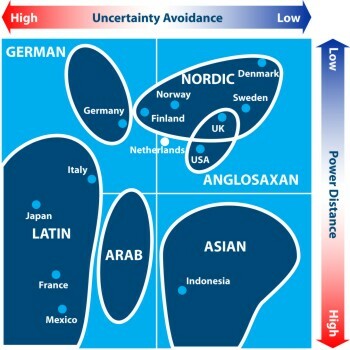 With regard to understanding the diversity of planning systems there is some merit in having a look at the cultural map of the world as offered by the Dutch sociologist Geert Hofstede (2001) as shown in figure 2 below. Figure 2. The cultural map of the world. Adapted form Gert Hofstede, (2001). Uncertainty avoidance: The need for preference of structured situations over unstructured or flexible ones. Power distance: The degree of inequality among people accepted by the population. The point is that the issues of uncertainty avoidance and power distance are both fundamental for the design of planning systems in any country or jurisdiction. Planning systems therefore varies according their cultural base. This explains why for example the systems in Nordic and Latin countries are quite different. The regional economic planning approach, where spatial planning is used as a policy tool to pursue wide social and economic objectives, especially in relation to disparities in wealth, employment and social conditions between different regions of the country. Central government inevitably plays a strong role. France is normally seen as associated with this approach. The comprehensive integrated approach, where spatial planning is conducted through a systematic and formal hierarchy of plans. These are organised in a system of framework control, where plans at lower levels must not contradict planning decisions at higher levels. Denmark and the Netherlands are associated with this approach. In the Nordic countries local authorities play a dominant role, while in federal systems such a Germany the regional government also play a very important role. The land use management approach, where planning is a more technical discipline in relation to the control of chance of use of land. The UK tradition of “town and country planning” is the main example of this tradition, where regulation is aiming to ensure the development and growth is sustainable. The Urbanism approach, where the key focus is on the architectural flavour and urban design. This tradition is significant in the Mediterranean countries and is exercised through rather rigid zoning and codes and through a wide range of laws and regulations. The UK has a discretionary system and yet there tends to be a close relationship between objectives of the system and the actual development. Denmark, Finland, Ireland, and the Netherlands have a moderate degree of flexibility in decision making, and planning objectives and policies are close to development that takes place. France, Germany, Luxemburg and Sweden all have systems which have little flexibility in operation, and where development in generally in conformity with the planning regulations. Belgium and Spain both have rather committed systems while there is only moderate relationship between objectives and reality. Finally there is group of countries, Greece, Italy and Portugal, where the systems are based upon the principle of committed decisions in plans, but where in practice there has been considerable discrepancy between the planning objectives and reality. It must be mentioned, that classifications such as presented above can only be seen as a very general overview, while, in the details, there may be all kind of nuances that reflect the specific conditions and cultural tradition of the individual country. The relative roles of the public and the private sector refers to the extent to which the realisation of spatial planning policy is reliant on public or private sources and the extent to which development might be characterised as predominantly plan-led or market-led. The Danish system, for instance, is mainly plan-led and highly decentralised. The Ministry of the Environment establishes the overall framework in terms of policies, guidelines and directives. Development possibilities are determined through the general planning regulations at local level (municipalities), and further detailed in the legally binding local/neighbourhood plans. Municipalities are also responsible for granting of building permits that serve as a final control in the system. Planning at municipal level is comprehensive and includes determination of land policies, land use planning, and land use regulations in term of urban/rural zoning and regulation frameworks for the content of more detailed and legally binding local/neighbourhood plans that must be provided prior to any major developments. The comprehensive municipal plans as well as the local/neighbourhood plans have to be submitted for public debate and for public inspections and objections before final adoption. This provides for public participation in the planning process at all levels. On the other hand, there is no opportunity for an appeal, inquiry or compensation regarding the contents of an adopted plan, even the binding local plans. Planning is considered as politics and the procedures of public participation mentioned above are regarded as adequate for the legitimacy of the political decision. However, planning regulations established by the planning system are mainly restrictive. The system may ensure that undesirable development does not occur, but the system will not be able to ensure that desirable development actually happens at the right place and at the right time, as the planning intentions are mainly realised through private developments. When there is a development proposal which is not in line with the plan, either a minor departure from the plan may be allowed, or the plan itself has to be changed prior to implementation. This process includes public participation, and the development opportunities are finally determined by the municipal council. On the other hand, development proposals that conform to the adopted planning regulations are easily implemented without any time delay. These legal means of planning control are shown in figure 3 below. Any planning policy or strategy will have to consider a number of contradicting professional and political attitudes to development control such as a social versus a liberal approach, and growth versus a balanced approach. In planning terms this refers to approaches such as regulation versus deregulation, and centralization versus decentralization. This shows that planning is politics. However, to be robust comprehensive planning must be based on all four approaches and methods of planning in order to appear as legitimate. This will include a balance between the functional land-use regulations normally designed by the professional planner; the demand for control and economic growth that is the traditional role of the politicians; the wishes for free market investments coming from the developer; and the often more grass-root based demands articulated by the citizens. The general trends in Europe in terms of the role of the planning systems are shown in figure 4 below. Figure 4. The general trends in Europe in terms of the political attitudes and planning approaches. 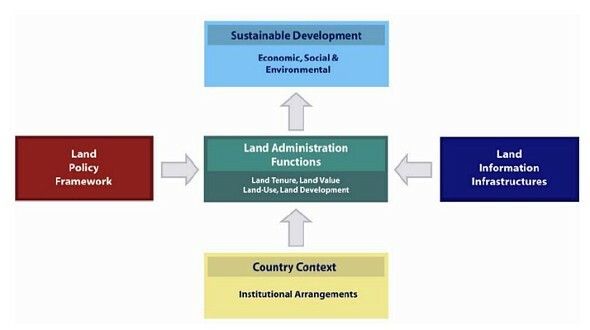 An integrated system of Land-Use Management for Sustainable Development is shown in figure 5 below. Integrated land-use management is based on land policies laid down in the overall land policy laws such as the Cadastral/Land Registration Act; and The Planning/Building Act. These laws identify the institutional principles end procedures for the areas of land and property registration, land-use panning, and land development. More specific land policies are laid down in the sectoral land laws within areas such as Agriculture, Forestry, Housing, Natural Resources, Environmental Protection, Water supply, Heritage, etc. These laws identify the objectives within the various areas and the institutional arrangements to achieve these objectives through permit procedures etc. The various areas produce sectoral programmes that include the collection of relevant information for decision making within each area. These programmes feed into the comprehensive spatial planning carried out at national, state/regional and local level. Figure 5. Integrated land-use management for sustainable development (Enemark, 2004). Furthermore, the system of comprehensive planning control is based on appropriate and updated Land Use Data Systems, such as the Cadastral Register, the Land Book, the Property Valuation Register, the Building and Dwelling Register, etc. These registers are organized to form a network of integrated subsystems connected to the cadastral and topographic maps to form a national spatial data infrastructure for the natural and built environment. In the Land-Use Management System (the Planning Control System) the various sectoral interests are balanced against the overall development objectives for a given location and thereby form the basis for regulation of future land-use through planning permissions, building permits and sectoral land use permits according to the various land-use laws. These decisions are based on the relevant land use data and thereby reflect the spatial consequences for the land as well as the people. In principle it can then be ensured that implementation will happen in support of sustainable development. A global approach to land management, as presented above, depends on appropriate structures of governance. In this regard, the issue of decentralisation may be seen as a significant key to achieving the general aim of sustainable development. In the Nordic setting, and many other places around the world, the obvious local arena for land-use planning and decision-making has been the commune - the municipality. It is argued that whatever outcome may emerge from a decentralised system of decision-making it must be assumed to be the right decisions in relation to local needs. Decentralisation thus institutionalises the participation of those affected by the local decisions. This argument is particularly valid in the area of land-use decision-making and administration. Land-use planning this way becomes an integrated part of local politics within the framework of plans and policies provided at regional and national level. The purpose is to solve the tasks at the lowest possible level so as to combine responsibility for decision making with accountability for financial, social, and environmental consequences. Another principle in relation to this concept of integrated land-use management is about comprehensive planning that combines policies and land-use regulations into one planning document covering the total jurisdiction. Presentation of political aims and objectives as well as problems and preconditions, should then justify the land-use planning and the more detailed land-use regulations. This also relates to public participation that should serve as a means to create a broader awareness and understanding of the need for planning regulations and enable a dialogue between government and citizens around the management of natural resources and the total urban and rural environment. Eventually, this dialogue should legitimise the local political decision making. In terms of informal urban or rural development there is a need for a monitoring system e.g. through continuing updating of the large scale topographic map base, and proper enforcement procedures to decide on such development in relation to the overall land policies. This paper does not attempt to present an overall global approach to planning systems and policies in Europe or a comparative analysis of the maturity or completeness of systems. In fact, the systems can hardly be compared since the cultural and institutional conditions various throughout the regions of the European territory – even the terminology and the meaning of spatial planning vary a lot. Instead, the paper attempts to identify some general characteristics while the key issue of planning control is discussed in more details. The concept of integrated land management is presented as a means to support sustainable development, and, at the same time, prevent and legalise informal urban development. The integration of land policies, land information, and planning control/land-use management should ensure that land-use decision making is based on relevant policies and supported by complete and up to date information on land-use and rights in land. This should also provide for establishing the relevant social and economic institutions in society in support of legalising the informal sector. The land management paradigm drives systems dealing with land rights, restrictions and responsibilities to support sustainable development, and it facilitates a holistic approach to management of land as the key asset of any jurisdiction. This represents a huge political challenge. It also represents a major challenge to the global surveying community that is seen as the key player in building and running these systems. Understanding the land management paradigm is the key to building integrated and mature systems that link policy making, good governance, land administration systems, and land information infrastructures to form a coherent approach for dealing with land issues to improve living conditions for all. Arguably, establishment of such mature systems that are trusted by the citizens is also the key to preventing and legalising informal urban development. This goes for, at least, the developed part of the world. In developing countries this approach must be supplemented by a range of measures that address the issues of poverty, health, education, economic growth, and tenure security. This is all included in the perspectives of the Millennium Development Goals. FIG and the global surveying community will respond very committed to the MDG´s over the coming years. Alterman, R., (Ed.) (1998): National level Planning in Democratic Countries – An international comparison of city and regional policy-making. Liverpool University Press. Enemark, S. (1999): Denmark – the EU Compendium of spatial planning systems and policies. Brussels. ISBN 92-828-2693-7. 124 pp. Enemark, S., Williamson, I., and Wallace, J. (2005): Building Modern Land Administration Systems in Developed Economies. Journal of Spatial Science, Perth, Australia, Vol. 50, No. 2, pp 51-68. European Commission (1997): The EU compendium of spatial planning systems and policies. Brussels. ISBN 92-827-9752-X. 192 pp. Hofstede, G. (2001): Culture's Consequences: Comparing Values, Behaviours, Institutions and Organizations Across Nations, 2nd Edition, Thousand Oaks CA: Sage Publications. Potsiou, C. and Ionnidis, C. (2006): Informal Settlements in Greece: The Mystery of Missing Information and the Difficulty of their Integration into the Legal framework. Proceedings of the 5th FIG Regional Conference, Accra, Ghana, March 8-11, 2006, 20 p.